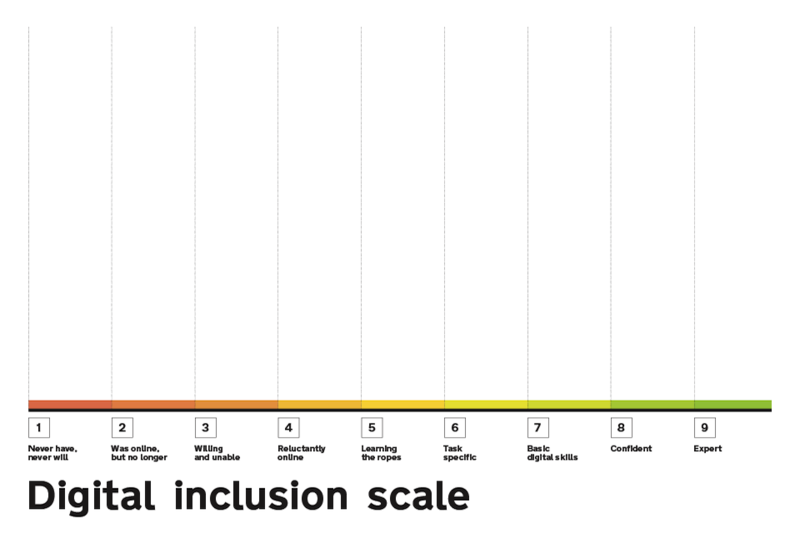 Last year an Annual Skills Survey here in DH concluded that about 20% of our staff considered themselves below ‘basic capability’ at digital stuff (with basic being defined as Level 7 on the Government Digital Strategy’s scale of inclusion). So either there’s a chronic lack of self-confidence here in the Department, or there’s some trouble afoot for us here in the Digital Team. 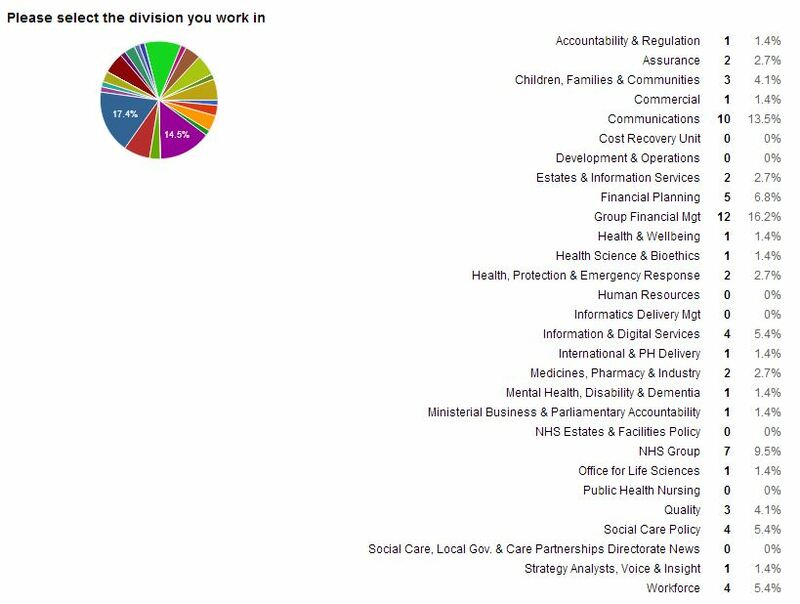 We needed to create some kind of tool that would assist everyone, across a vast spectrum of levels, and enable us to do some kind of reporting at the end to be sure capability had gone up. In the end, we decided on calling it our Digital Passport, which kind of does what it says on the tin- it aims to put everyone in a position to ‘travel’ up our digital scale of inclusion. Ultimately, this should improve efficiency, engagement and skills for all members of the Department, no matter what their role. Users- the importance of a user-centred approach when developing anything, from policy to operations to HR to…well, everything. Finally, we designed a self-assessment for everyone to take at the end (and, as we always practice what we preach, we did this using open internet tools like Google Forms, Google Analytics and WordPress). About 60% of our champions responded, and 84.5% of them passed. A few topics in particular had much lower scores though, even from our Champions, so we'll be taking a look into those areas. 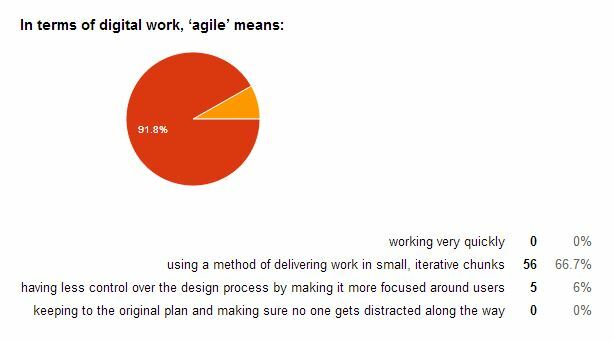 The question which got the most wrong answers was the one about writing web content. 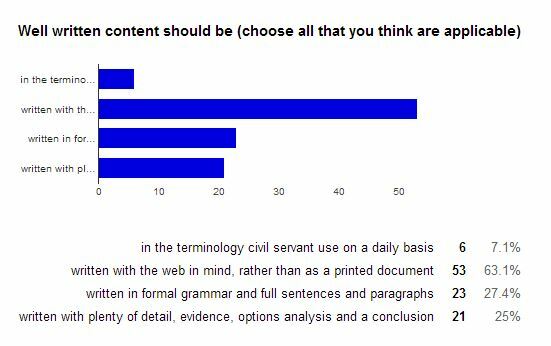 The ideal answer was b) written with the web in mind, but clearly many participants still felt that web content should be written much like a formal written government document. Most participants had understood that the user is central to a digital approach to product or service development, and is at the heart of the new Open Policy Making agenda as promoted by Cabinet Office. Nonetheless, a few still felt that the end product (i.e. the solution) should be the main focus, rather than the user (or problem). Participants had a good understanding of both the opportunities and risks presented by digital as a medium of working remotely, and most answered correctly (selecting the first 3 answers). Notably however, a few still felt it was acceptable to share all information using open tools, whereas the Passport highlights this is only an appropriate approach with non-sensitive information, which is not restricted. 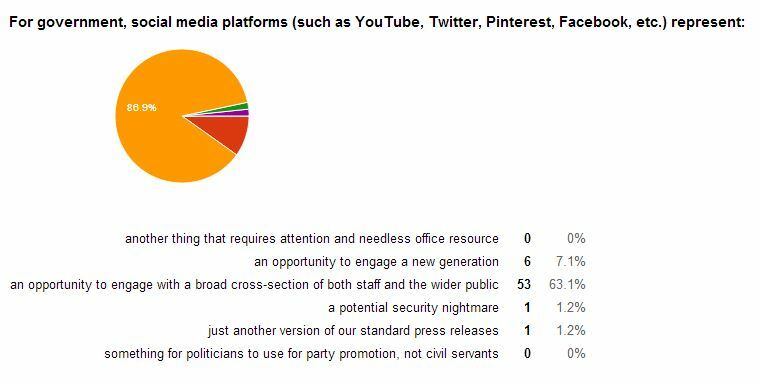 Most participants recognised the potential that social media platforms represent, yet a small minority still considered them ‘a potential security nightmare’ and no better than standard press releases. There was a great variety in answers to the question on which online tools are appropriate to use, and we will be taking another look at the wording of the question to make it clearer. (when in fact all bar one of the options are appropriate for sharing non-sensitive DH data). Alarmingly, only 52% of respondents recognised that Wikileaks is NOT appropriate for sharing government information, suggesting a need to emphasise this message in a clearer way in the next iteration of the Passport. Really interesting to see how much insight you can get from an online self-assessment tool. I'm sure it will be really helpful in targetting interventions to help people build their skills. Look forward to hearing how the roll out goes beyond the champions network. Fantastic stuff! I work for DWP Business Transformation Group and we are undertaking a very similar project to upskill our colleagues at the moment. I would love the opportunity to talk to you about best practice and work to provide something amazing for our end users. Please contact me peter.nuckley@dwp.gsi.gov.uk and hopefully we can help each other get the best out of our projects.